The Americans with Disabilities Act (ADA) requires employers with 15 or more employees to provide qualified individuals with disabilities an equal opportunity to benefit from employment-related opportunities, prohibits employers from discriminating against individuals with disabilities, and requires employers to offer reasonable accommodations. NAE wants to provide you with the necessary tools and guidance to manage ADA situations. Charges of disability discrimination have increased in recent years and the Equal Employment Opportunity Commission (EEOC) is aggressively litigating against employers who fail to provide reasonable accommodations. This half-day training event will cover the fundamentals of the ADA and is intended to help you understand how to meet your ADA obligations and avoid an unpleasant interaction with the EEOC. This training is designed for human resource professionals, supervisors, and management interested in understanding their employment-related obligations. At the end of ADA Fundamentals, you will understand how your business needs to approach disabilities in the workplace, how to manage requests for accommodation, the importance of engaging in the interactive process, and more. This program has been approved for 3.5 HR (General) recertification credit hours toward aPHR™, PHR®, PHRca®, SPHR®, GPHR®, PHRi™ and SPHRi™ recertification through HRCI. 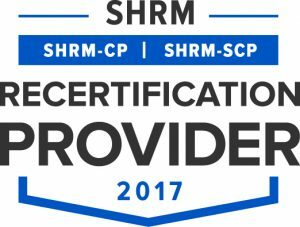 This program is valid for 3.5 PDCs for the SHRM-CPSM or SHRM-SCPSM.